Protect your rights and maximize your payout after a Wisconsin car accident. We answer key questions and show you how to build a strong insurance claim. After a car accident, you will have a lot to deal with. Learning state laws, where to obtain accident reports, and how to deal with law enforcement and insurance companies is just the start. Knowing what to say and do at this crucial time can have a big impact on any future claim. To help you navigate through the maze, we’ve compiled a list of 10 steps. They will help you build a strong property damage and personal injury claim, while avoiding the frustration and anxiety often associated with car accidents. 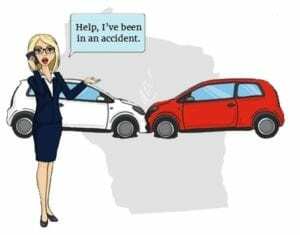 We’ve also answered some of the most frequently asked questions that arise at an accident scene, and included links to applicable Wisconsin state laws, reference articles, insurance company regulations, and more. What information will the 911 dispatcher need? What if no one was injured and only our cars are damaged? What if I collide with an unattended car or other property along the road? Do I have to file an accident report with the police? Can the other driver use the Accident Report against me at trial? Is there additional information to help my claim? How about witnesses and their statements? 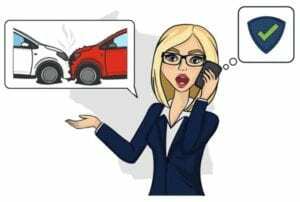 Do I have to report the accident to my insurance company even if it wasn’t my fault? Should I tell the other driver if I think the accident was my fault? What if the other driver says I’m at fault and demands I pay for their damages? Are there mobile apps to report accidents to insurance companies? 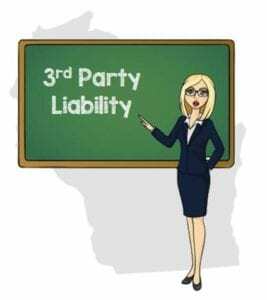 What does Wisconsin’s 3rd party liability mean to me? 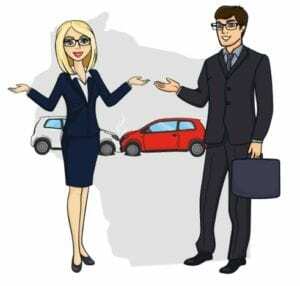 What are the minimum amounts of car insurance required in Wisconsin? Are the police officers required to listen to my version of the story? What is the role of law enforcement at an accident scene? What if the police gave me a ticket? How can I learn more about suing in one of Wisconsin’s Small Claims Court? Why would I file a lawsuit in Small Claims Court? Do I need an attorney to represent me in small claims court? What if the insurance company is stalling and the Statute of Limitations is pending? If you’ve been in a Wisconsin car accident, you must stop immediately as close to the scene as possible. Once stopped, seek out the injured and call 911. Note: Reasonable assistance includes transporting or making arrangements to transport the injured person to a hospital for treatment. You must do this if it is apparent that treatment is necessary or if any person injured in the accident requests it. Your location: Look for street names, highway exits or mile markers, traffic signs, and landmarks. Tell the dispatcher which side of the road you are on and what direction you were traveling. Be as specific as possible. This will help ensure emergency personnel will arrive quickly. If there are injuries: Tell the 911 dispatcher if there are obvious signs of injuries, if anyone is unconscious, or if anyone is complaining of nausea, vomiting, pain or discomfort. If the scene is dangerous: Accidents scenes are inherently dangerous. Victims may be walking around looking for damage to their cars, oblivious to passing cars or oncoming traffic. Cars may be pointed in different directions or protruding into traffic lanes. Let the 911 dispatcher know what the scene looks like. This helps determine which emergency services are dispatched. Your injuries may be obvious, and can include gashes, fractures, bruising, or head trauma. However, some symptoms may not appear for hours or even days after the accident. Your body produces adrenaline immediately after a collision that can mask pain and underlying injuries. If the paramedics arrive, allow them to evaluate you. Tell them if you’re experiencing any form of pain or discomfort. If the paramedics decide your injuries are not serious enough to transport you to an emergency room, be sure to visit your regular doctor as soon as possible. This is especially important if you decide to file a personal injury claim. Insurance companies are notorious for denying claims when there is a gap between the accident and when the injured person seeks medical care. The longer you wait to seek medical attention, the greater the chance the insurance company takes the position your injuries were not a direct result of the collision, but instead sustained later in a separate incident. What if no one was injured and only our cars have damage? Even if the accident resulted only in minor property damage, you must stop and exchange the required information. What if I collide with an unattended vehicle or other property on the side of the road? Stop immediately. Make a reasonable effort to locate the owner of the car and explain what happened. Give them your name and address. If after making a reasonable effort you are unable to locate the owner, find some paper and write down your name and address, and a statement detailing the circumstances of the collision. Then leave the note in a conspicuous place on their car. Each law enforcement agency has their own policies dictating when police officers and paramedics are dispatched to an accident scene. In most cases, resources are limited so emergency personnel will only be dispatched when there are reported injuries, evidence of a crime, or when the accident scene present a dangers to others. You must report the accident if it resulted in an injury or death to anyone involved, or if there is property damage worth $1,000 or more. If state or government property is damaged in the amount of $200 or more, you must also report the accident. You can download the accident report form from the Wisconsin Department of Transportation website. No. Accident reports filed pursuant to Wisconsin law may not be used as evidence in any trial arising out of the accident. However, the accident reports can be used in a subsequent administrative hearing such as a license revocation hearing held by the Wisconsin Department of Transportation. Otherwise, the accident reports are inadmissible as hearsay. Evidence gathered at an accident scene will become the foundation of your future property damage or personal injury claim. That’s why the time immediately after a car accident is crucial. If you’re injured, or you sustain damage to your car, you need evidence to support your demand for compensation from the driver and their insurance company. Accident scenes are constantly changing. It’s important to take advantage of the time immediately after the accident. Before long, cars are driven or towed away, and the people involved and any witnesses will leave the scene. You don’t want crucial evidence to disappear along with them. To succeed in a property damage or personal injury claim, you will need to prove the other driver was at fault and their actions resulted in damages to you. Note: You can find the VIN on the car’s dashboard in the left corner where it meets the windshield. It is also on the driver’s insurance card or inside the driver’s side door jam. Include road obstructions, potholes, etc. Yes. Using your digital camera, cell phone, iPad or other electronic device, take multiple photos and videos. Be sure to include sound. 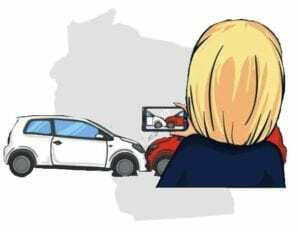 Photographs and videos can identify the position of the cars immediately after the collision, the weather, road obstructions, potholes, traffic lights, street signs, and more. Photographs and video can also reflect the demeanor of the drivers, passengers, pedestrians, and witnesses, and record admissions of fault, signs of intoxication, and more. While witnesses are under no legal obligation to speak with you, they can be a rich source of helpful information. If a witness agrees to speak with you, provide them with paper and a pen. Ask the witness to write down what they saw and heard. Once they finish writing down their impressions and observations, ask them to sign and date each page. Your car insurance policy is a binding legal contract between you (the insured) and your insurance company (the insurer). The policy obligates your insurance company to provide coverage for you up to the limits of your insurance policy, including legal representation if the other driver files a lawsuit. In return, you are obligated to cooperate with your insurance company in the investigation of the accident. This includes promptly reporting the accident to your insurance company, even if you believe you were not at fault in the accident. You can find these contractual obligations in the “Notice of Occurrence” and “Cooperation Clause” of your policy. While each insurance company’s policies are different in form and substance, they all basically contain the same information. Under certain circumstances, if you fail to comply with the terms of your policy, your insurance company may decide not to renew your policy at its expiration date, raise your premiums, or in some cases, even cancel your policy. Yes. If you don’t report the accident, you are likely in violation of the terms of your policy. Moreover, from a practical standpoint, by failing to give notice to your insurance company, you give the other driver and their attorney an advantage. This is especially true when a driver leaves the scene of an accident saying they weren’t injured. Because symptoms of injuries may not appear for hours, it is possible the other driver was injured and just didn’t know it at the time of the accident. If that occurs, the driver may decide the accident was your fault and go on to retain an attorney to pursue an injury claim against you. If you failed to report the accident to your insurance company immediately after it occurred, they won’t have any idea of what’s coming when you receive a letter from the driver’s attorney threatening to sue you. At that point, your insurance company may decide you violated the Notice of Occurrence clause of your policy. If that occurs, your insurance company may have the right to deny coverage. At a minimum, it is possible your premiums will be raised, or your policy may not be eligible for renewal. Lynn was on her way to work one morning, heading north on the US 45 toward Racine. She intended to take exit 145. To do so, Lynn pulled into the right hand turn lane and waited patiently for traffic to clear so she could safely exit. As Lynn began to exit, Daniel had entered the lane right behind her. Thinking Lynn was going to complete her turn to the exit, he moved ahead. What he didn’t realize was that Lynn had slowed to let another driver pass. As she did this, Daniel collided with the side of her car. The two pulled over to the side of the road and got out to examine the damage. Daniel asked Lynn if she was hurt and she said she was “fine.” Daniel said he was a little shaky, but otherwise he was feeling fine. A police officer arrived on scene and ticketed Daniel. They exchanged insurance and contact information. Because the accident appeared to be minor, with no damage to either car and no apparent injuries to either driver, they left feeling relieved not to be hurt and that their cars were intact. Unfortunately, Daniel chose to ignore the cooperation clause in his insurance policy that required him to promptly report an accident. He was afraid that since he received a traffic citation, if he reported the accident his insurance premiums would rise. The next morning Lynn could barely get out of bed. Her back was sore and she couldn’t move her neck without feeling pain and discomfort. Her husband Joe drove her to the local hospital’s emergency room. Lynn’s doctor diagnosed her with a whiplash injury and disk herniation to the L5 level of her spine. The doctor prescribed Ibuprofen for the pain and Flexeril for the muscle strain. The physician also scheduled her for an MRI exam. Several days later Lynn retained a personal injury attorney. Two months later Daniel opened his mail to find a letter from Lynn’s attorney informing him that she sustained serious injuries in the accident, and that her medical and chiropractic bills amounted to $30,000 to date. By failing to immediately report the accident to his insurance company, Daniel not only violated the terms of the cooperation clause, but he also gave Lynn’s attorney a substantial head start on the claim. By the time Daniel received the letter from Lynn’s attorney, he had already located witnesses to the accident, secured copies of Lynn’s medical records and bills, a medical narrative from Lynn’s physician confirming her injuries were a direct result of the accident, her MRI results, and more. Daniel was understandably nervous. He wondered if his insurance company would defend him in the claim, or if he was going to be on his own. If Daniel had simply complied with the terms of his automobile insurance policy by contacting his insurance company right after the accident, he might not be in this position. If he had contacted his insurance company, they would have already opened an investigation into the claim two months ago. Now Daniel had to wait to see if his insurance company would defend him in this claim or cancel his policy altogether. Yes. Obtain the other driver’s insurance information and call them to report the accident. An insurance company claims adjuster will open a claim. Be sure to ask the adjuster to give you the claim number. You will need it when discussing the accident with them. There will often be two claims adjusters involved in the investigation of the accident. One will handle the property damage aspect of the claim and another will take care of the personal injury aspect of the claim. No. A traffic accident isn’t the place to admit fault. While you may truly believe you were at fault, you have no legal or contractual reason to admit fault in an effort to clear your conscience. There are just too many variables in a car accident. Negligence is rarely cut and dry. The issue of fault can be subjective, rather than objective. While you may think the accident was clearly your fault, what you may not know is the other driver may have also been at fault. The other driver may have contributed to the accident and you just don’t realize it. As a result, your degree of fault may be a lot less than you initially thought. Do not pay the driver any amount of money at the scene of the accident. Furthermore, do not make any agreement to pay the driver at a later date. Do not write down anything for the driver other than your name, contact information, insurance details and car registration information. This is important whether you believe you caused the accident or not. This is exactly why you have car insurance. Let your insurance company investigate the circumstances of the accident. After doing so they may decide that you caused the accident, the other driver was 100% at fault, or that you each contributed to the accident occurring. Are there mobile apps available to report accidents to insurance companies? Yes. Today there are several mobile apps available to help you report a car accident. The apps are best used in conjunction with your own gathering of evidence. They help your insurance company quickly evaluate the accident in an effort to defend you against any unwarranted claims of negligence, and to assist you in a claim against the other driver. 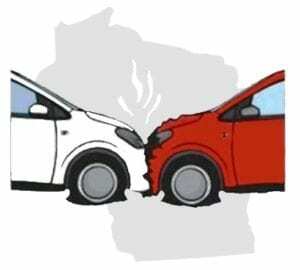 The State of Wisconsin follows the Modified Contributory Negligence Rule. Under this rule, if you’ve been injured in a car accident but you are partially responsible for causing the accident, you can still recover compensation from the other driver. However, if the percentage of your responsibility (contributory negligence) for the accident is determined to be 51% or higher, you will be legally barred from recovering any compensation from the other driver. Oliver was driving west on Union Hills Drive while on his way to pick his wife up from work. Because he was running late, he decided to text her. Mary Ellen was on her way home from the mall. She was driving northbound on Northwestern Ave in Racine. As she approached the traffic light, it turned yellow, but Mary Ellen decided to increase her speed to try to make it through the intersection before the light turned red. Unfortunately, the light turned red as she was passing through the intersection. As a result, Mary Ellen collided with Oliver, seriously injuring him. Oliver’s medical bills amounted to $20,000. Oliver filed an insurance claim with Mary Ellen’s insurance company, asking for $60,000, representing his medical bills, out-of-pocket expenses, lost wages, and his pain and suffering. The insurance company offered Oliver the amount of $20,000 to settle his entire claim. Oliver sued Mary Ellen. During trial, the evidence showed Mary Ellen failed to stop at the red light, and as a result, she was legally responsible for causing the accident. However, the evidence also showed Oliver was texting at the time of the accident. 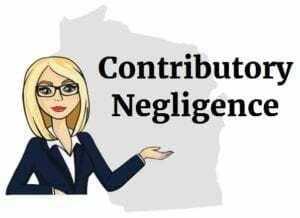 Under Wisconsin’s Modified Contributory Negligence law, the jury apportioned Mary Ellen’s percentage of negligence at 60% and Oliver’s at 40%. As a result, the jury decided Mary Ellen had to pay Oliver $36,000, representing his 40% negligence for the accident and Mary Ellen’s 60% negligence. However, if the jury found Oliver’s negligence to be at 51% or more, he legally would be barred from recovering any compensation from her. Under Wisconsin’s 3rd party liability rule, drivers who are injured or who sustain property damage because of the negligence or fault of another driver, may pursue that driver for compensation. To protect everyone on its roadways, the State of Wisconsin requires drivers to carry specific minimum amounts of property damage and personal injury insurance. Local law enforcement officers are trained to investigate accident scenes. When officers arrive at the scene, they have several duties. You are required to obey their lawful direction and cooperate in their investigation of the accident. Are police officers required to listen to my version of the story? You may speak with the officer to give your version of events leading to the accident. However, the officer is under no legal obligation to discuss the accident with you. It depends. If the officers ask you to identify yourself, including your full name and address, proof of registration, and proof of insurance, you must comply. However, if you are being questioned by the police about driving under the influence, possession of drugs, or for any other action which might result in criminal charges or arrest, you have the right not to answer those questions. 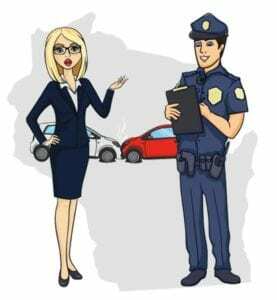 If the police officer decides you violated one or more of Wisconsin’s traffic laws, you may be issued a traffic citation. You can attempt to dissuade the officer, but once the citation is issued, you must accept and sign it. Signing a traffic citation is not an admission of guilt. Nor is it admissible in court as conclusive evidence of fault. Rather, your signature is simply an agreement you will appear at a later date and time to face the charge. At that time, you may enter a plea of not guilty and contest the citation. You can also attempt to negotiate a “plea bargain” with the prosecutor. This may include you paying a fine and attending a driver education course. The benefit of a plea bargain is that once those items are completed, the citation will be dismissed and won’t appear on your driving record. Some property damage and personal injury claims are easy to handle without an attorney. However, other claims always require representation by an experienced professional. You can represent yourself if your injuries are relatively minor, “soft tissue” injuries. These can include sprains, strains, contusions, abrasions, minor cuts, whiplash, and the like. Soft tissue injuries often cause pain, swelling, bruising, pain and discomfort. Normally, these claims are settled within a relatively short time and rarely end up in court. Because the settlements for minor injuries are modest, retaining an attorney could result in your receiving a net settlement much less than you could have negotiated without an attorney. If your injuries are serious, “hard injuries” such as fractures, disk herniations, deep gashes, 3rd degree burns, head trauma, and the like, you will need an experienced personal injury attorney. In serious injury claims, lawsuits are often required. Lawsuits permit your attorney to issue subpoenas for such items as policy limits, prior accidents, financial status, and more. Lawsuits also permit your attorney to take depositions of the driver, witnesses, and others with knowledge of the accident. These are all actions you can’t take on your own. There is just too much to lose by representing yourself in a serious injury claim. By representing yourself, you forfeit your leverage with the insurance company. When the insurance claims adjuster gives you the “final offer,” without an attorney the adjuster knows there is little you can do about it. In addition, serious injury claims often require substantial up-front costs including hiring medical experts, independent testing, accident reconstruction, court reporters, interrogatories, requests for production, and other legal procedures required to successfully resolve the case. Most personal injury attorneys will not charge you any legal fees for an initial office visit. It is in the attorney’s best interest to offer this free consultation to determine if your claim is viable, and to see if there is a probability of success so that any settlement or court award will be sufficient to compensate you and the attorney for his or her time. Once an experienced personal injury attorney reviews your medical records and bills, police reports, witness statements and other relevant information, the attorney will be able to tell you the strength of your claim, the approximate time it will take to settle, the probability of the claim having to go to trial, and the general amount of settlement or court award you can expect. 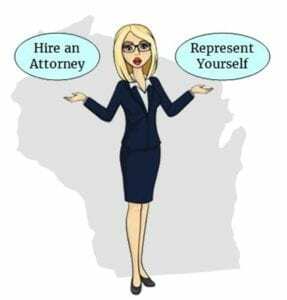 When the attorney accepts your Wisconsin car accident case, s/he will not charge any legal fees or costs for preparation of the case until, and unless the case is settled or won in court. At that time, depending upon the written agreement with your attorney, you will be obligated to pay anywhere from 25% to 40% of the gross settlement amount or court award. The State of Wisconsin’s Court system has a small claims division in place to provide citizens a low-cost process for resolving civil disputes. This allows people to settle claims without having to retain attorneys or be subject to the normally strict code of evidence and court procedure required in higher courts. Wisconsin small claims courts have jurisdiction to hear lawsuits in any amount up to $5,000. How can I learn more about filing a lawsuit in one of Wisconsin’s Small Claims Court? 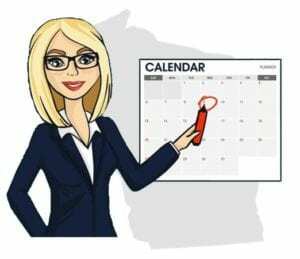 For general information, forms and procedures, view the Basic Guide to Wisconsin Small Claims Actions, which is available on the Wisconsin Courts website. No. 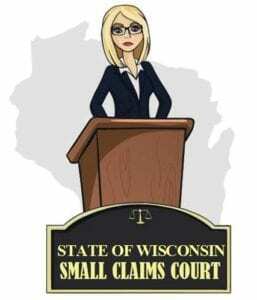 Attorneys are permitted to appear in Wisconsin Small Claims Courts, but they are not required. For an attorney to agree to represent you in small claims court, the amount in controversy has to be high enough for the attorney to make a profit, while leaving you with enough money to pay your medical and property damage bills. With $5,000 as the limit for lawsuits in small claims courts, it unlikely you will find an attorney to accept your case. However, this doesn’t mean you shouldn’t consult with a personal injury attorney before filing your case. In most cases, the statute of limitations period commences on the day of the accident. If you don’t settle your personal injury claim and fail to file a lawsuit within that time, you will lose your legal right to further pursue the at-fault driver for compensation resulting from the car accident. The statute of limitations for personal injury claims in the State of Wisconsin is three (3) years. What do I do if the insurance company is stalling and the Statute of Limitations is pending? The insurance company claims adjuster is under no legal obligation to settle your claim. Nor are they required to remind you of any impending expiration of the statute of limitations. Remember, the insurance company claims adjuster is not your friend. The adjuster is an expert in dealing with property damage and personal injury claims. You can be confident the last thing any insurance company wants to do is pay you one penny more than required. Be sure to enter the statute of limitations expiration date in your calendar, your computer, and on any cell phone calendar apps. Make sure to give yourself plenty of reminders. Compensation for a Placenta Abruption/Whiplash?